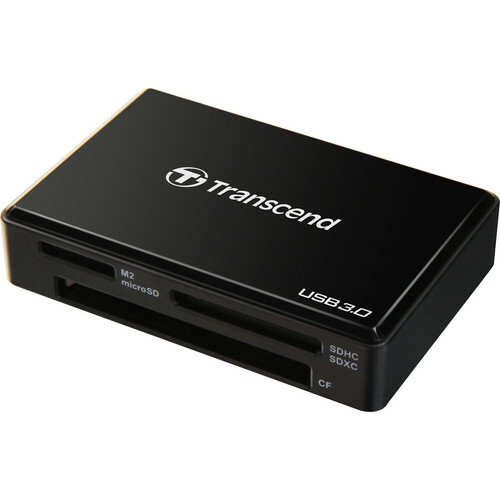 Designed for use with a variety of memory cards, the USB 3.0 Multi Card Reader RDF8 from Transcend makes it easy to transfer files quickly and easily thanks to USB 3.0 connectivity. The card reader comes equipped with SD, microSD, MS, and CompactFlash slots accepting SDHC, SDXC, microSDHC, microSDXC, MSXC, and UDMA 7 CF card formats. Simply attach the card reader to your Windows, Mac, or Linux based computer and begin transferring files to and from any of the aforementioned memory cards. Additionally, this reader features a built-in LED indicator allowing you to see when data is being transferred. Box Dimensions (LxWxH) 6.0 x 4.2 x 1.3"
USB 3.0 Multi Card Reader RDF8 (Black) is rated 4.6 out of 5 by 426. Rated 5 out of 5 by Andypogi from Works so well I'm buying a 2nd one! Bought my 1st of this card reader about 30 months ago. Since then it's traveled to 3 other countries, and 3 states in the USA with me. Suitcases, backpacks, camera bags and pockets; it just keeps working for me. It is very fast on USB 3.0 ports. It has held up extremely well. It is plug and play on WIN 7 & 8. The cord is sturdy and a good length for me; long enough, but easy to pack/carry. My family members have a variety of card readers of their own, but keep borrowing my Trandsend RDF8, hence I'm donating the original to them and buying a new one for me. I did not even look at other ones, just searched B & H for this one and bought it. Rated 4 out of 5 by Nadav the Editor from Perfect for fast transfers I just recently got into doing timelapses which can eat up space on a card quickly. I was able to dump 20gb in about 5 minutes, which is neat. My old card reader did the same amount in about 2 hours, so definitely worth it for that reason alone. I've only used it once so far, and dumped two cards during that time. One was the 20gb I talked about, the other was about 5gb and it had a couple failures on the transfer. For the record, that card was in a camera that was dropped that day, so I think it'd probably a card issue and not a card reader issue. I'll be using it more in the oncoming weeks, and will find a way to update the review if I can. Rated 1 out of 5 by Ben Y. from Corrupted .CR2 files, not recommended for RAW This reader may work well for JPG and other compressed images, but when copying a CF card with hundreds of .CR2 files from my Canon 5DIII, nearly all of the images were corrupted. (The CF card was made by Transcend as well, so I thought it was very strange that they didn't work together.) Thankfully, the reader did not actually affect the original files; it was only the copied files that were unreadable. When I put the CF card in a Bower card reader, the files came through just fine. Too bad, because this was a good price. Rated 2 out of 5 by william from firmware upgrade INFECTED?!? There are some issues with this on my USB 3.0 connections. Have to re-format flash memory read thru this when I delete files no longer needed. Whole card then needs reformatted. So, I tried to download the Transcend firmware directly from the Transcend website. When I try to run the software, my virus software goes bonkers, screaming that this is RANSOMWARE and the program is blocked to save my computer! This has now happened twice, 3 months apart. First time I asked Transcend about it and no response.Now I can't get any cards to be read from this.Not happy. Rated 5 out of 5 by photoguy123 from Amazing piece of equipment I purchase two of these readers (one as a gift). It has been only a week now, but this product performs beautifully. I will keep you updated if it fails within a year. Additional comment: I have never tried to play my photos on my TV before, but gave it a shot using this card reader. I was thrilled to see that I could not only play my photos on a large TV Screen, but use my remote to forward or reverse. It will be great to sit in the comfort of a large living room using a 60-inch HD screen to show my clients their wedding images instead of huddling around a 30-inch monitor. (This is probably old news to a lot of people using a card reader+TV). Rated 5 out of 5 by Jason from Fast with a fast card This card reader works very well. Windows 7 recognized it without a problem - plug-and-play. Every card I've placed in it has shown up on the desktop very quickly. Copy speeds vary, depending on the card speed. But, for the first time, I can tell a difference in my cards, whereas before they were all held back by the USB 2 reader I had been using. I have achieved copy speeds averaging around 30MB/s from my Sandisk Extreme SD card, but only about 20MB/s from a Trascend Class 10 card. As others have commented, the cables are short - and particularly the power cable. It works on my desk, but the power cord could be longer. Rated 5 out of 5 by Stevie P from The best card reader I have ever held! The best card reader I have ever held in my hand. I purchased this with the expectation that my next Mac will have USB 3.0 in it. The unit feels really well made in my hand and has worked like any other card reader. I have it in computers that use USB 2.0 USB and it worked great and seemed faster so I am expecting great things with USB 3.0. The price was great and this is possibly one piece of equipment that will not become out dated to soon. One thing I really liked about it was the cord that goes between the card reader and the computer, this is the first one that is very flexible and does not force the card reader to go where it wants but it goes where I want it and stays even though it is short it is OK because of the flexible cord. Is it possible to concurrently transfer data from multiple cards and/or card-to-card when inserted into the reader (e.g. CF and SD simultaneously)? It is not possible to transfer data concurrently from different cards while using this card reader. HiDoes this item work on the latest Mac OS 10.9 Mavericks? Yes, this reader will work on Mac OS 10.9 (Mavericks) without any issues. For Panasonic P2 memory cards, you will actually need a specific memory card reader http://bhpho.to/1o98UFg, which is compatible with Mac OSX and Windows. Hello is this compatible with a Macbook Pro 10.7.5? I also read that it turns RAW files to Jpeg, is this true with video mov files as well? Yes, the Transcend USB 3.0 Multi Card Reader RDF8 is compatible with the Macbook Pro 10.7.5. However, this product does not convert file types, it is simply a tool to transfer images/data to a computer. I will need to purchase a longer cable for my system. What type of USB cable does this reader require? Will this card reader work with a San disk SDHC UHS-1 extreme pro class 10? I've not used it with that exact card, but regularly use with a SanDisk Extreme SDXC 45MB/s 64GB C10 U1 card. Hope this helps. Yes, we spoke with Transcend and they have confirmed that it is compatible with Windows 8.1. Would this reader work with an SDHC class 4 card? Any class SDHC card should work with this.